Winter has come early this year (2010), and I am packing my rucksack with the extra gear needed to protect me from the icy weather that has arrived with it. Walking in the hills in winter brings with it the necessity to carry additional equipment over and above what we require during the summer months. During the winter months gear such as gloves, torch, gaiters and a plastic Bivi bag become essential items of equipment for trips into the hills. One item of winter gear that I have carried with me since boyhood is a Balaclava. When I was a child throughout a Bradford winter, the boys could be seen making their way to school looking very much like modern day Ninjas, with woollen Balaclavas pulled down over their head and tucked in at the neck. The history of the Balaclava is associated with the appalling conditions met by British troops during the Crimean War. During the siege of Sevastopol, in terrible winter of 1854/55 the troops were held up in the little port of Balaclava, sited 8 miles south of Sevastopol. The condition of the road which linked Balaclava to the besieged city, made it impossible to transport supplies held in the port of Balaclava to Sevastopol. The British troops, who were running short of food and supplies, soon began to suffer from Starvation and frostbite. Reports from the battlefield began to reach Britain; in particular articles in the Times detailed the British commissariat's failure to provide winter clothing for the troops. The resulting public outcry stirred the commissariat to send out protective clothing in the form of a hood which covered the top of the head and also the ears and neck. These hoods subsequently became known as Balaclavas. 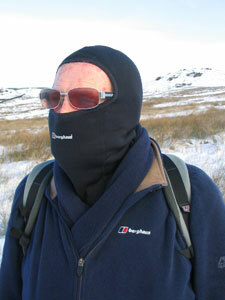 Balaclavas are an essential item of winter clothing and are not just for bank robbers and the SAS. More heat is lost through the top of the head than any other part of the body. They come in many different shapes, sizes and materials. Some cover the whole face except the eyes, while others have a hole for the mouth to breathe through. I prefer the type that leaves only the eyes exposed, even though your breath can escape upwards and fog your glasses if you use them. In the sixties the only available balaclavas, were made from wool which after a while made your head and neck itch unbearably, Joe Brown the famous rock climber was noted for wearing one. Joe could often be seen around Llanberis wearing his balaclava rolled up on the crown of his head complete with a pom-pom on the top. Nowadays balaclavas are made from materials such as, wool, pile, polartec windstopper fleece and even silk. I believe that the best fabric for balaclavas is fleece and my own balaclava is a Berghaus Power Stretch, I find it a comfortable fit which I can use under my hood or under a helmet. It is manufactured from Polyester and Nylon with some Lycra for stretchiness, and when wet absorbs very little water. A Balaclava is very versatile and can be rolled up into a compact hat to cover only the crown of the head if desired, or it can be made to fit around the neck like a scarf or pulled beneath the chin if you need to keep your mouth exposed. In cold wintery conditions I prefer to use mine as a full face mask, only occasionally pulling it off my head to use as a neck gaiter, and when conditions allow, I will roll it up to cover the top of my head only. I would like to conclude with a reminder of additional equipment that you need to take with you when walking in the hills in winter. A good pair of four season leather boots is very important, gaiters, fleece jacket, fleece or warm trousers, thermal top and a pair of good quality walking socks. Waterproof jacket and trousers and a flask of hot drink and a bivi bag, head torch with spare bulb and battery. This is not intended to be a complete list, but only to serve as a reminder.